Rudicorn | Leah Palmer Preiss ~ Curious Art: Acrylic miniature painting on text collage on wood, 3" x 2"
Rudicorn Acrylic miniature painting on text collage on wood, 3" x 2"
This little oddment began as a sketch for Illustration Friday’s “Unicorn” prompt, turned into an ornament given as a gift, & now it’s a greeting for you all: wishing you a holiday season full of rare & unexpected delights! 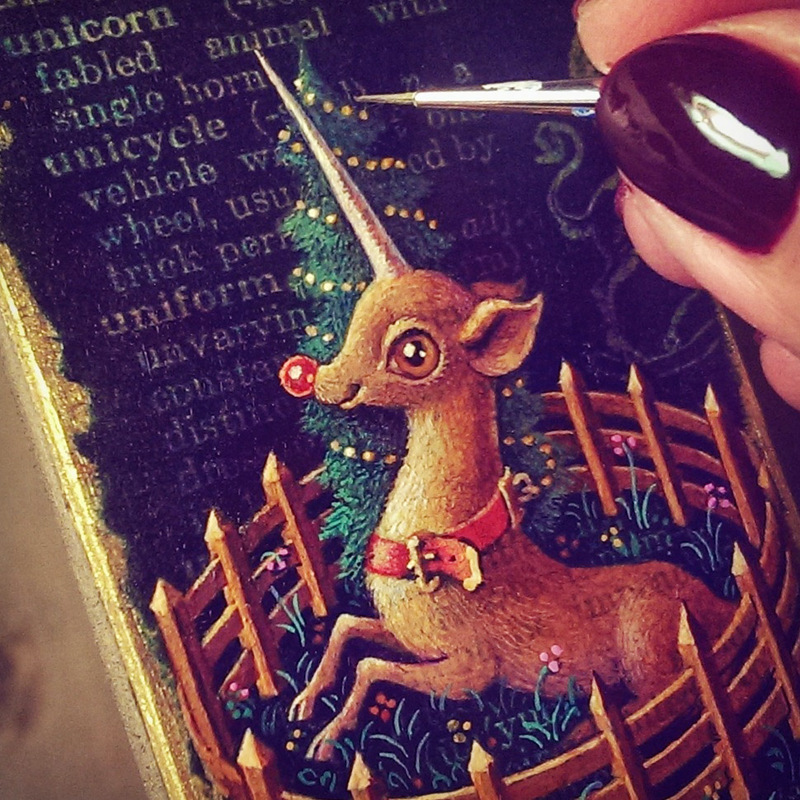 This entry was posted in MANIAtures and tagged Acrylic, Art, Christmas, Creatures, Holiday, Illustration Friday, mAniature, Miniature, Painting, Rudolph, Silliness, Unicorn on 20December 2015 by Leah. And happy 2016 from Artichokistan! Ah, that may very well be the case! Happy 2016 to you too! He would make a great pet for ringtoss at night! Wishing you all the best in 2016, Leah! You could use wreaths for the rings! Best to you, too, Ted!